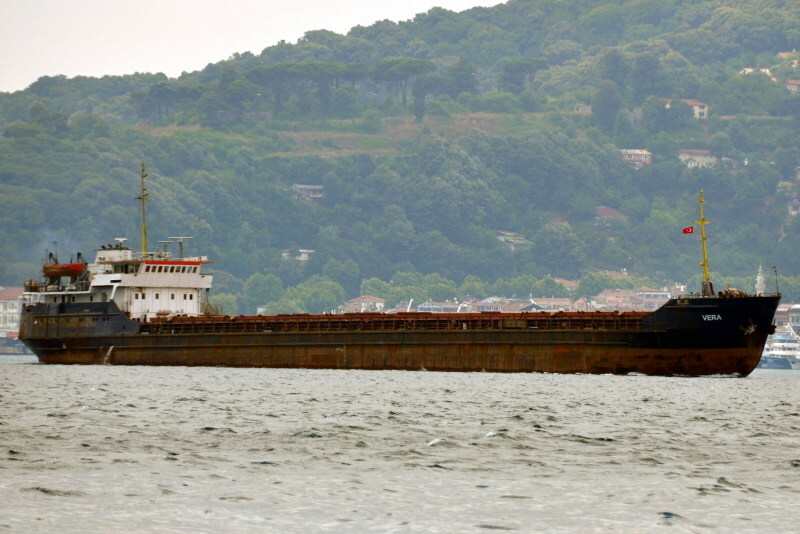 General cargo vessel Rimma suffered mechanical failure while transiting Bosphorus in northern direction on Dec 6 13. Vessel reported failure at 0250 LT, Traffic control sent a tug, which took the vessel to outer Istanbul road in Marmara sea. 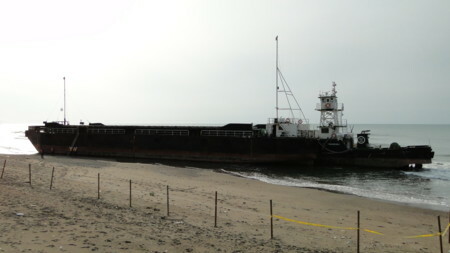 As of afternoon Dec 6 vessel was in the same position anchored on road. 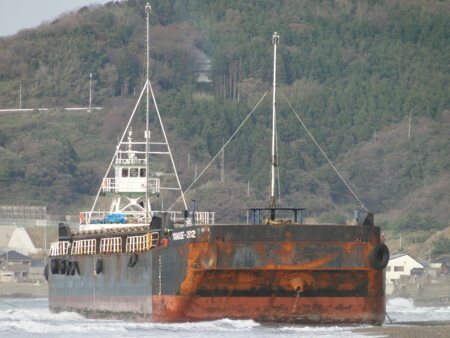 Vessel was en route from Tekirdag Turkey to Yeisk Russia. General cargo vessel Rimma, IMO 8874902, dwt 3180, built 1970, flag Cambodia, manager POSEIDON LTD-KHERSON. 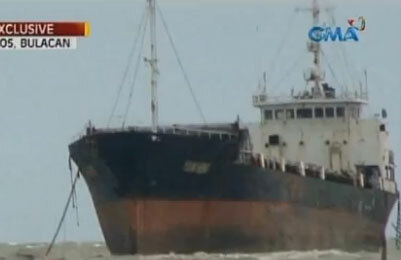 An abandoned Cambodian cargo vessel was found grounded in Manila Bay off Malolos, Bulacan Tuesday morning. 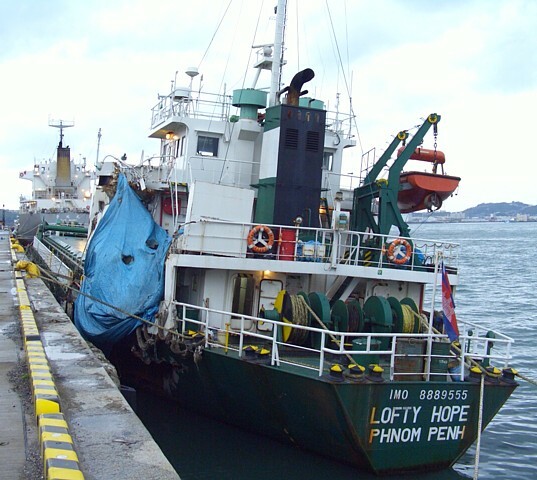 According JP Soriano's report on GMA News TV's Quick Response Team, the cargo ship MV Yuan Heng, reportedly operated by Chinese nationals, may have drifted from Mariveles Port in Bataan. 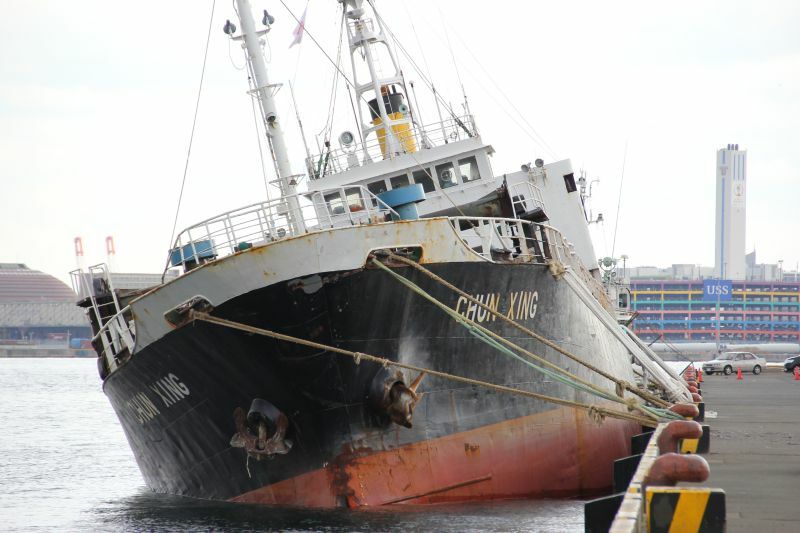 Citing initial investigation, Soriano said the ship may have drifted away from the port, where it was dry-docked for four years, when Typhoon Labuyo hit the area. 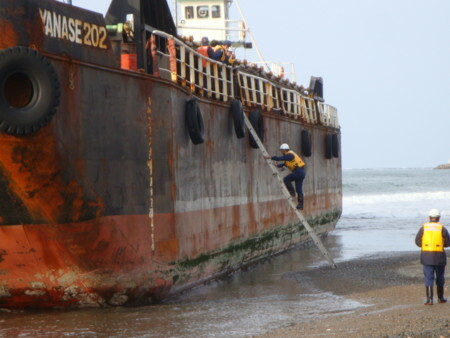 Soriano said when the abandoned ship was found, it was covered in rust and some parts had already deteriorated. No engine was also found, though it was not clear when it went missing, he added. 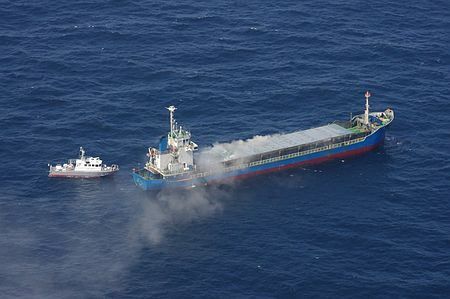 Police are now looking for a certain Castro, who may be the possible owner of the ship, Soriano added. 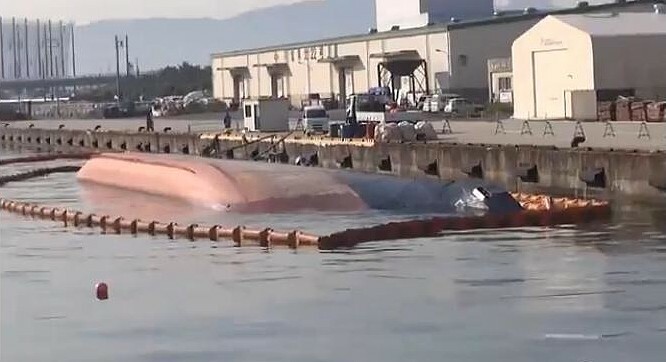 According to the Philippine Coast Guard, the ship will be towed, but the date has yet to be set. Fishermen and residents in Malolos expressed concern over the possibility that when the tide rises, the boat might drift off again and hit their fish pens, Soriano said. Authorities were alerted by local fishermen who reported an abandoned Chinese vessel, anchored or stranded off the coast of Malolos, Bulacan province, Pamarawan area, just 13 nautical miles NW of Manila. 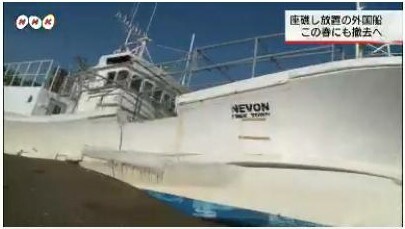 ABS-CBN News in a video footage showed stranded vessel describing it as a Cambodian flagged tanker under the name of Yuan Heng. 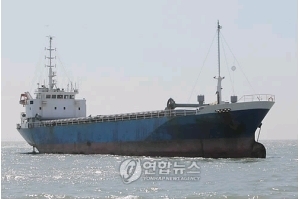 According to papers found on board, vessel is owned by S-American Far Eastern Shipping Company and operated by Shandong Jinghai Industrial Group. 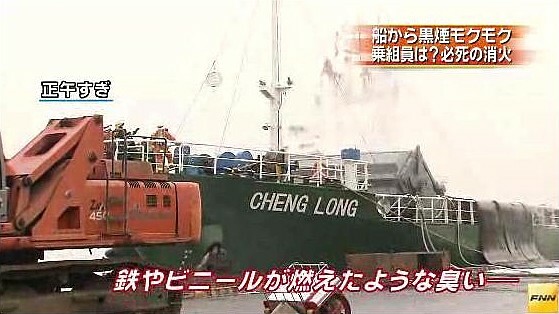 From the look of the vessel in the video, it is definitely not a tanker, but a general cargo vessel. General cargo vessel Yuan Heng, IMO 8217790, dwt 1598, built 1983, flag Cambodia. Last AIS signal dated 19.6.2010, East China Sea. 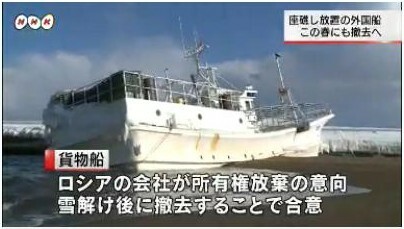 Most probably, this is the vessel in question. Investigation under way. Fate of the crew unknown, no details given on the circumstances and approximate date of the abandonment. 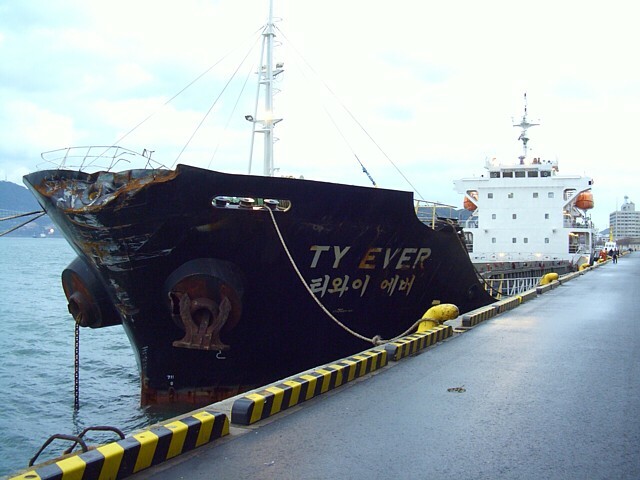 MANILA, Philippines - An abandoned Chinese cargo ship identified as MV Yuan Heng was discovered in Manila Bay off Malolos, Bulacan on Tuesday. Local fishermen reported having seen the vessel drifting off Pamarawan as typhoon Labuyo blew through the area, according to local reports. Malolos City Hall employee Roann Dionisio said in a radio interview that her team found the ship abandoned and decrepit. "Sobrang dumi sa loob ... 'yong mga hagdan kapag tinapakan mo parang bibigay na. Nakakuha kami ng blankets at saka flag ng China," Dionisio said. 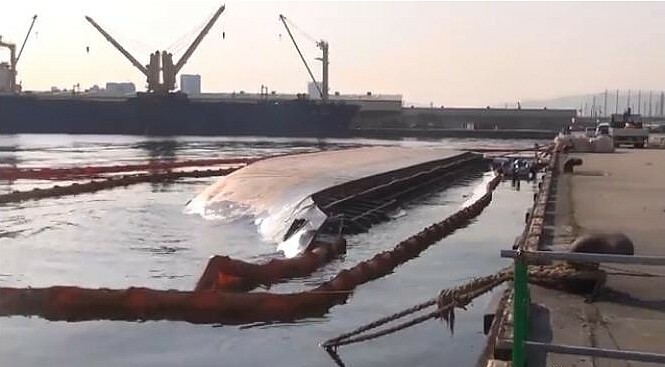 Bulacan Governor Wilhelmino Sy-Alvarado has said that the ship was originally docked at Seafront Shipyard in Mariveles, Bataan before it floated toward Malolos at the onslaught of the typhoon. 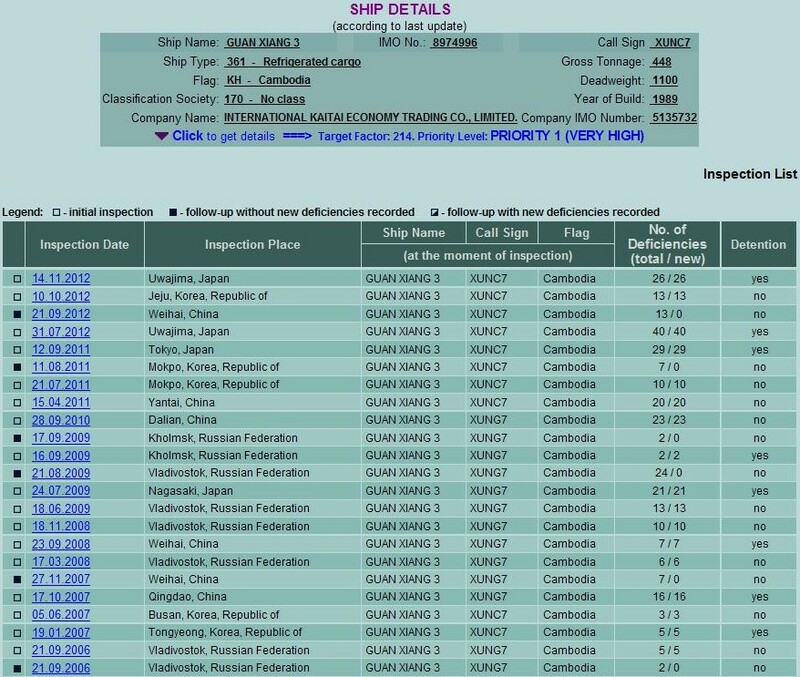 The ship was found to be owned by South American Far Eastern Shipping, operated by Shandong Junghai Group and was registered in Phnom Penh, Cambodia, Sy-Alvarado added. On Dec 27 at around 1000 LT general cargo vessel Sormovskiy-119 got a hole in a rudder compartment while proceeding in ice convoy with icebreaker assistance in Azov-Don sea channel, Azov sea. 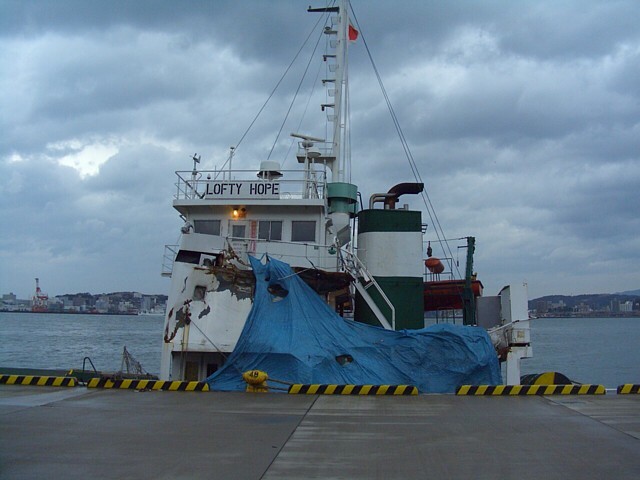 The hole of 50 mm diameter was patched, vessel resumed voyage to Samsun, Turkey. Vessel left Rostov-on-Don port on Dec 26. general cargo vessel Somrmovskiy-119 IMO 8035154, dwt 3346, built 1982, flag Cambodia, manager MED MORYAK DENIZCILIK LTD STI, Turkey. 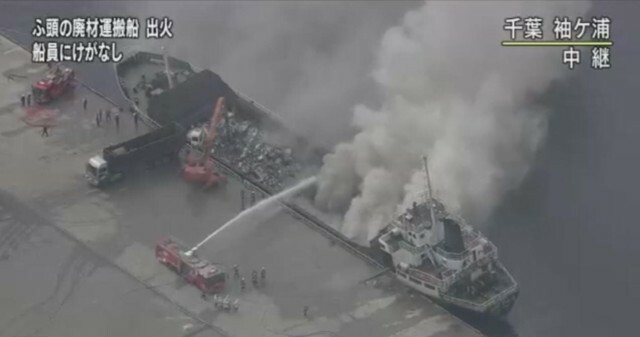 General cargo vessel Haoda 6 caught fire off the coast of the southwestern Japanese prefecture of Fukuoka at around 03:00 LT Oct 5, either in Inner Japan Sea or in Japan sea, en route from Chiba to Ningbo with 980 tons of scrap on board. 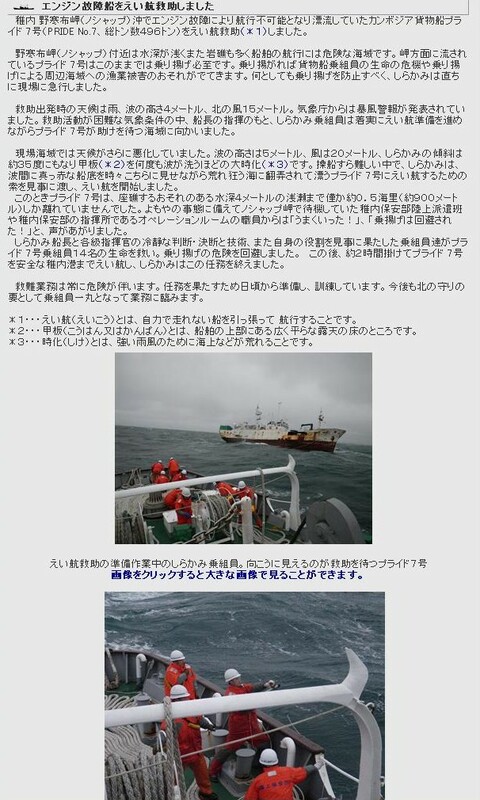 Japanese Coast Guard ship was sent to assist Haoda 6, no other details available as of afternoon Oct 5. crew is 9, including 7 Chinese nationalities. 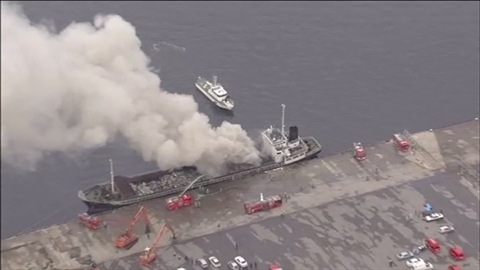 It’s a second Chinese freighter loaded with scrap to caught fire in Inner Japan sea in 8 days, on Sep 27 fire erupted on board of Hao Han in Osaka Bay. On photos Hao Han on fire. General cargo vessel Haoda 6 IMO 8864282, dwt 1578, built 1992, flag Cambodia, manager SHANGHAI XIANGDA SHIPPING CO.
At around 21:00 LT Sep 27 fire erupted on board of Chinese general cargo vessel Hao Han under way in Osaka Bay, Japan, en route from Osaka to China with cargo of scrap. 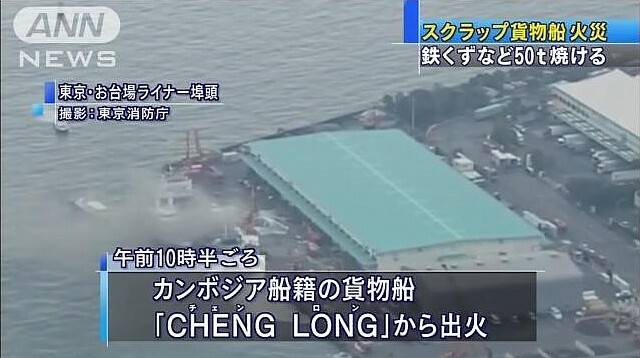 After 12 crew failed to extinguish fire by own means, master requested assistance, and Japan Coast Guard ship took on board all the crew with no injures. 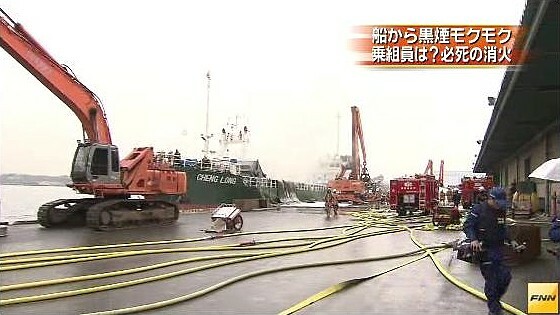 Reportedly fire was extinguished around midday Sep 28. General cargo vessel Hao Han IMO 9310329, dwt 2847, built 2003, flag Panama, manager YANTAI RUIHAI INTL SHPG MGMT. 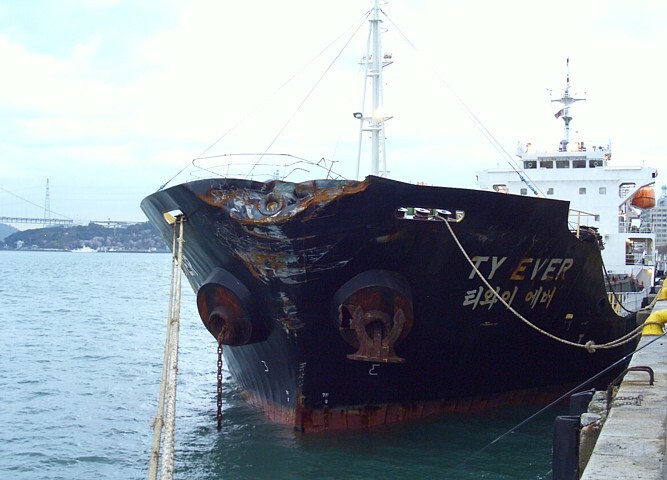 The Volgo-Balt 199 disaster once again focused industry’s attention on a problem of substandard shipping safety in general, and in Black sea in particular. River-sea type, general cargo vessel Volgo-Balt 199 sank in Black sea on Dec 4 last year, 9 crew died, and 4 survived the disaster. 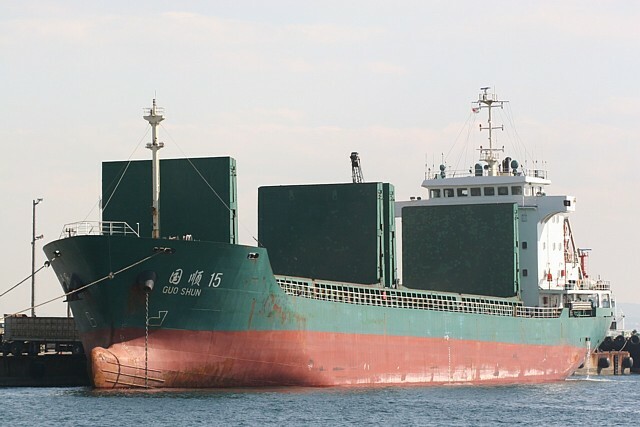 Vessel loaded with 3,300 tons of coal was en route from Mairupol, Ukraine, to Turkey, got caught in storm and broke in two, sinking in just minutes, some 20 miles off Turkish coast. 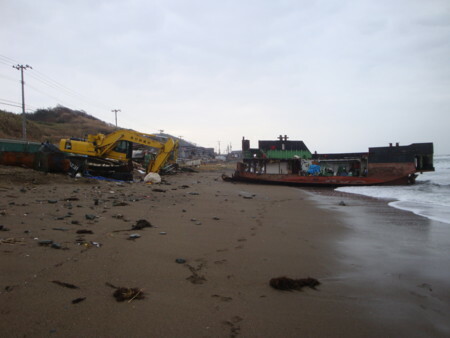 On Jan 31 of the same year, another river-sea type vessel Vera sank during the storm on Eregli road, roughly in the same area where Volgo-Balt 199 sank. 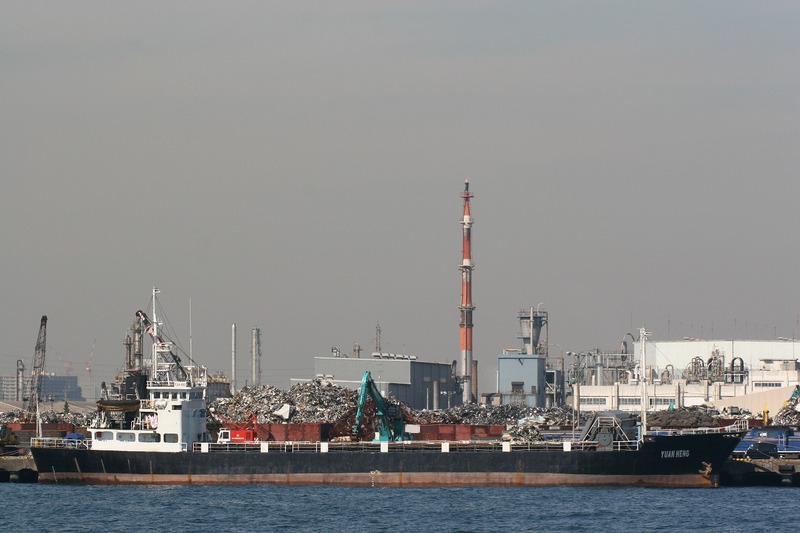 Vessel was en route from Rostov-on-Don to Izmir, Turkey, loaded with scrap, and anchored on Eregli road to outwait the storm. 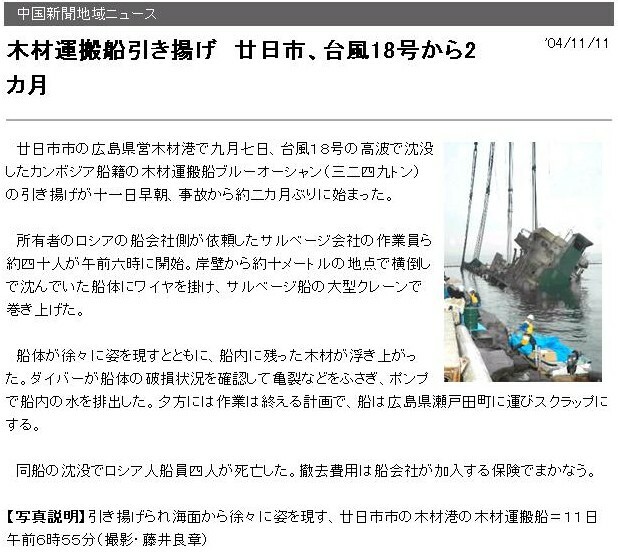 4 crew were rescued, 7 died. 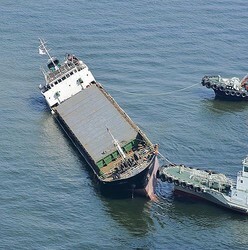 In June last year, ITF and affiliated unions published a brochure “Black sea of shame”, slating regional ship owners as irresponsible greedy flock, and the whole coastal shipping in Azov-Black sea area as extremely dangerous for the seafarers working on board of regional coasters. On the wake of Volgo-Balt 199 disaster, ITF and affiliated unions, mainly SUR (Seafarer’s Union of Russia), are launching a news campaign aimed at what they call, “substandard shipping” in Azov-Black sea region. To comprehend the problem and the safety risks, one must scrupulously consider all known facts and statistics, avoiding emotions which prevail in media coverage of the Black sea disasters, and in Trade Union’s proclamations and allegations. m/t Volgo-Balt 199 was vessel of river-sea type, widely spread in European waters. The owner of the vessel operates 5 other vessels, also coasters. The only criteria available for the assessment of the safety of those vessels, is the detention history. 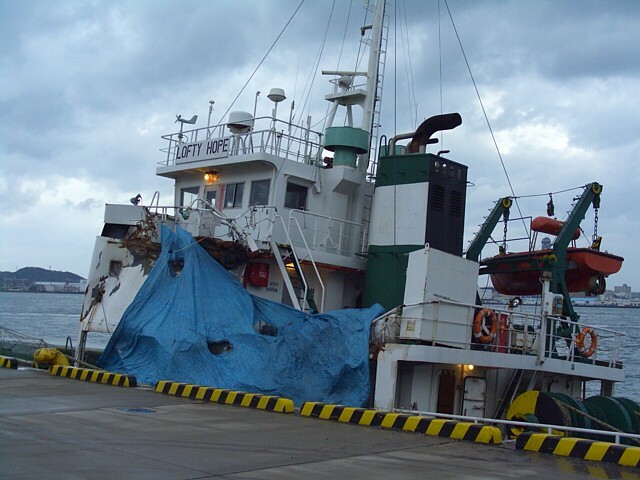 All 6 vessels, including the ill-fated Volgo-Balt 199, have a good history in this regard, after they were obtained by the owner in question. Before the present owner, their history wasn’t so good. 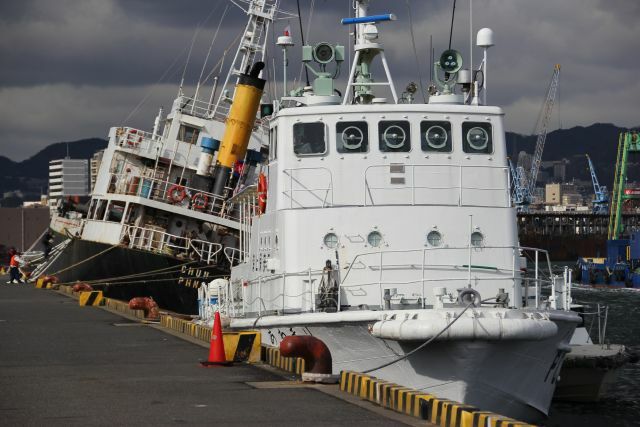 Together with other information gathered after the disaster, including the Ukrainian Shipping Inspection statements, it may be presumed, that Volgo-Balt 199 was up to the required standards, or to put it short, as seaworthy, as the river-sea type vessel may be. 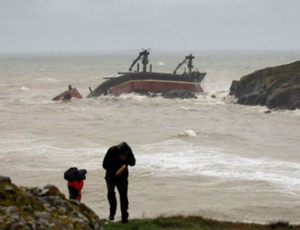 The question is, what is seaworthiness of the river-sea type vessel, and why technically nonfaulty vessel sank in though strong, but still, regular for this region and this time of year storm? The river-sea type was developed in former Soviet Union sometime back in the late 50-th, with the main idea of creating a vessel capable of navigating both inner waterways and the coastal seas. 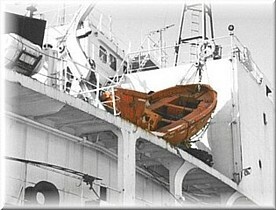 There are many projects of those vessels, they are widely built since the 60-th up to the present days, but whatever is project or year of built, the vessels still, are not seaworthy in a generally accepted meaning of seaworthiness. By Class requirements they’re restricted in navigation and can’t sail further than 50 nautical miles from a refuge, but in fact, such a restriction is a dissimulation. The vessels are too long, flat-bottomed and not strong enough in terms of structural strength. The meaning of it is very simple – vessels are prone to capsizing even in fresh weather, if they become disabled and open the side to the waves, and prone to hull breaking in more or less strong storm, even if they’re under power and can keep against wind and sea. Vessel may be more than 50 miles off the coast, or less than 5 miles, it doesn’t actually matter. What matters is the sailing itself – river-sea type can’t sail into any storm, it’s mortally dangerous. River-sea type in this respect, is similar to a soldier in battlefield, who’s moving around by short spurts from one shelter to another, during the short periods of fire cease. River-sea type has to sail from one port to another, from one area to another with enough places of refuge, during the periods of safe weather conditions, depending on favourable weather forecasts and captain’s knowledge and feeling of local weather. To be caught in storm is, if applied to river-sea type, an accident in itself, requiring an investigation, even if the vessel managed to survive. 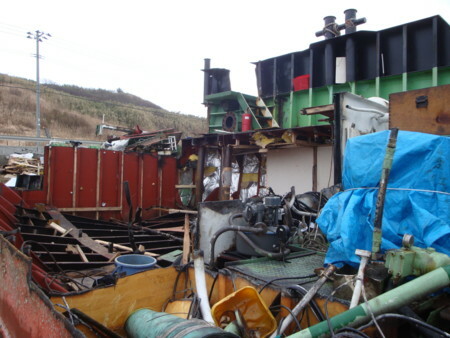 The long-term statistics show, that 2 out of each 100 river-sea type vessels sink due to unfavourable weather conditions. 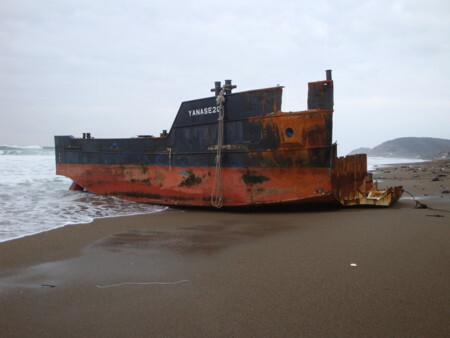 “There are some 2,400 dry cargo vessels trading in the area, of between 2,000 – 12,000 dwt. Close to 1,000 vessels are of 2,000 – 4,000 dwt. Trade is dominated by the vessels over 20 years old, with some 800 vessels being over 30 years old, and only some 500 vessels are of 10 years old, or newer”. ITF obviously considers the above figures to be so frightening, that there is no need for any other argumentation. For a superficial reader, for general public, yes, there is no need for anything else, such ages seem to be very frightening indeed. For an industry insider, the figures ITF is operating are hardly frightening or alarming. Just for one reason – if we check the world merchant fleet statistics, we’ll easily figure out, that some 62% of global fleet of dry cargo vessels of 2,000 – 12,000 dwt are 20 years old or older, the remaining 38% being 0-20 years old, and this proportion exactly correlates with Black sea figures. But there is another reason, too. 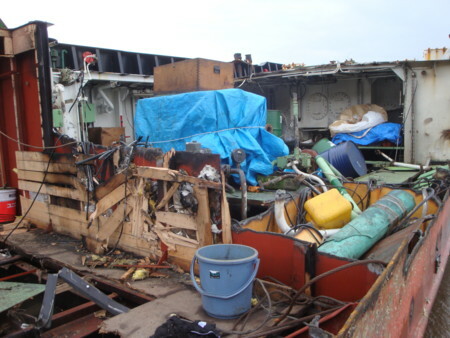 There is no need in scrapping general cargo vessels of 2,000 – 12,000 dwt achieving10-15, or even 20 years, ages. They’re not state-of-the-art floating wonders of high-tech, and they don’t have to be such. They’re basically rather simple devices, which may be safely exploited for 20-30 years period, providing they’re properly maintained and operated. Coastal shipping doesn’t need modern vessels, it needs safe, sound and reasonably cheap vessels, easy to operate and maintain. In this respect, river-sea type has an advantage of sailing at least one third time of their lives in fresh water, which is much more merciful to the hull than sea water. 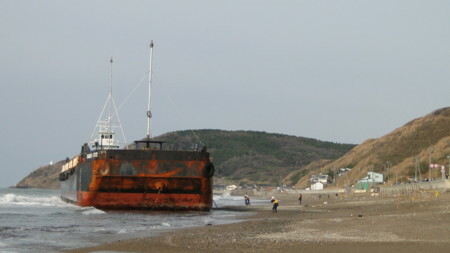 Most owners of the river-sea type vessels are small and middle-sized companies, struggling for survival in hostile business environment of Russia and Ukraine. They have to fight for the survival on the market outside their countries, and simultaneously, they have to fight the almighty bureaucracy and all-embracing corruption inside their countries. What’s worse, they are not sure of the future, especially middle and long termed. The rules of the game which is called “private business”, both in Russia and Ukraine, may change overnight, leaving the ship owners with little choice except either fleeting the country, or selling out everything and leaving shipping for good. One can hardly expect them to invest all capitals they have into modern vessels, let alone ordering newbuilds. Still, many of them manage to modernize their fleets, like for example, the company which owned ill-fated Volgo-Balt 199. Of course the pace of modernization is very low, but keeping in mind, that the States in question do everything they can to make the owners life short of unbearable, it’s a wonder how the owners manage to do what they do. The river-sea type is risky in comparison with any other type of purely sea-going vessels. They are risky not because of age, but because of their basic conception. 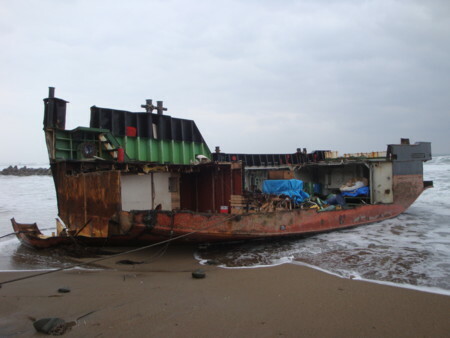 The vessels are a compromise between seaworthiness and an ability to navigate inner waterways, and technically speaking, the vessels are not satisfactory both to river and sea standards. But there is one advantage, which makes up for all other lacks and flaws. Economically the vessels are very effective, bringing profits to the whole number of other industries except shipping. A river-sea type vessel may reach towns which lay far inland, and carry goods at unrivalled cost and time. Volgo-Balt may sail to Ural, load cargo of steel from Perm steel mills, and deliver it directly to Italy or Algeria, to Rostock or to Birmingham, saving fortunes on transportation costs. On a return voyage vessel may deliver goods to Kazakhstan or Iran, again with great savings for shippers. 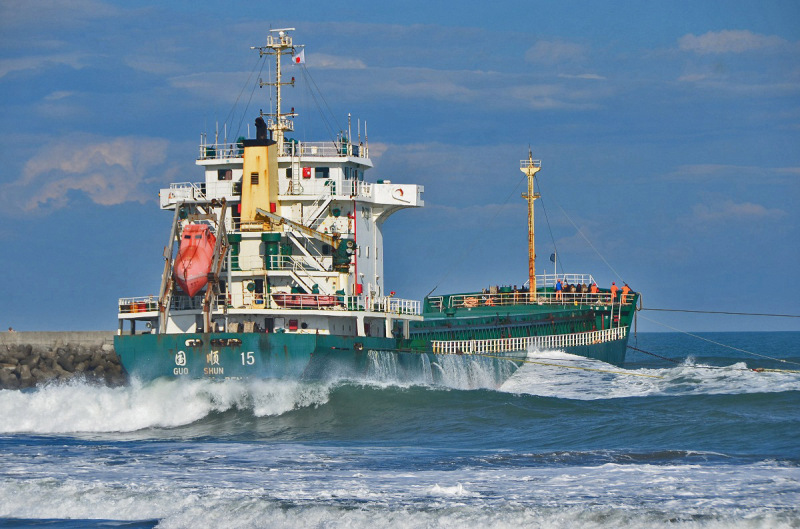 There is only one guaranteed way to make river-sea vessels as safe as any other sea-going vessels, it is banning them from sailing in high seas. But such a ban will have negative effect for many industries and economy in general, which will bear the burden of raised transportation costs. There is another, social aspect, too. Nearly all the companies which own and operate river-sea type vessels are considered by seamen community as “start-up” or “final stop” grounds. Young and ambitious start their ocean-going careers, turning from green rookies into professionals on board of coasters, which is especially true for the Ukrainian and Russian ratings. Aged ones find their final employment with not too educationally demanding coaster positions, which is especially true for officers, as the officers of river-sea type vessels, mostly, don’t have such profound education and knowledge of English, as officers of ocean-going vessels. 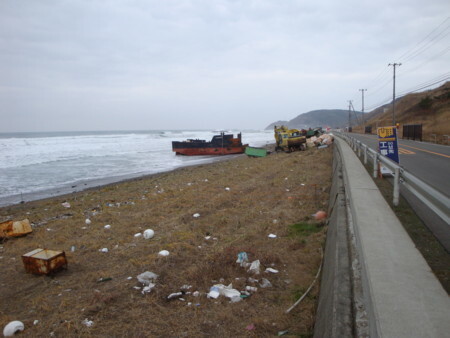 Statistically, river-sea type is barely more risky than any other type of the cargo vessels. Technically, it’s much more risky. 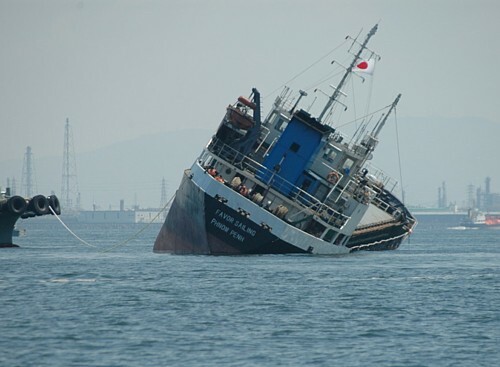 The river-sea type risk is derivative of seamanship of the captain and the responsibility of the operator. 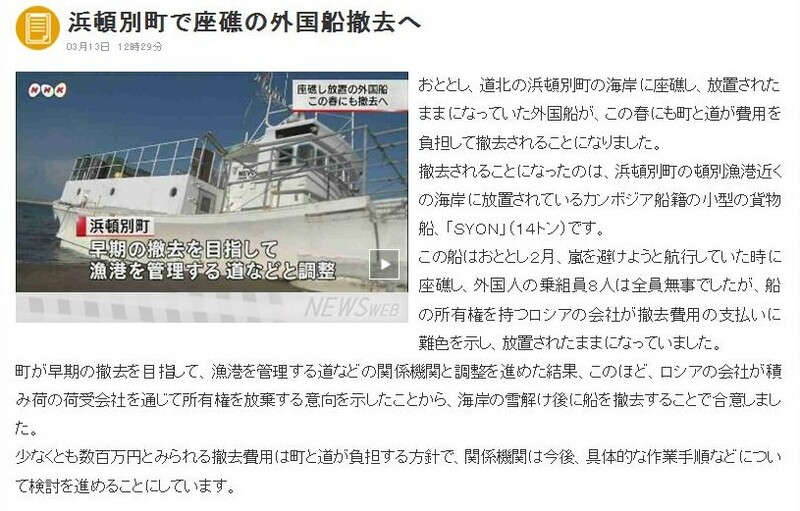 In other words, ocean-going vessel may survive the mistakes made by operator or captain by sailing through storm, while river-sea vessel may not. There are ways of course, to make river-sea type vessels safer than they are now, by applying mostly, more strict regulations. For example, to prohibit the vessels to leave the port in bad weather or if forecast is promising storm, making it the responsibility of port administration, or PSC, and making the new regulation compulsory throughout all Europe. That alone will make river-sea type about as safe as any next type in coastal waters. What is definitely not bound to make the river-sea type safer, is the new campaign the ITF and affiliated unions are trying to launch, using the Volgo-Balt 199 tragedy as a pretext. Their true concerns lay elsewhere, but not in the spheres of safe and socially responsible shipping. 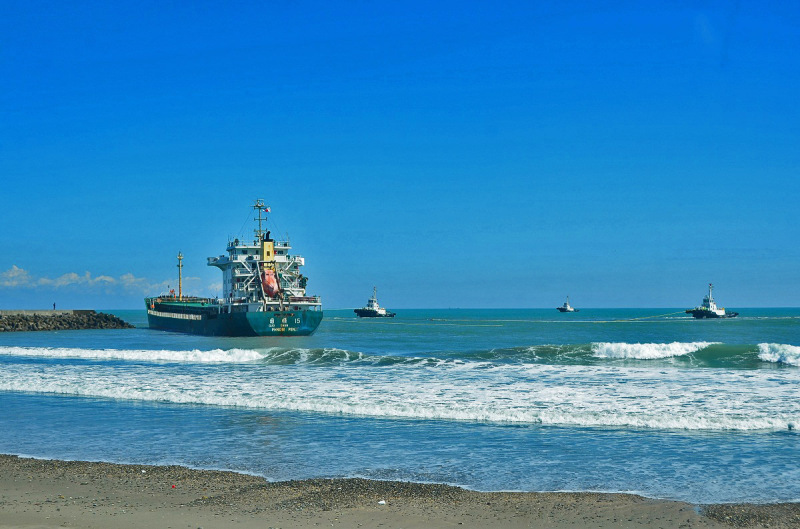 The SUR for example, bluntly declared, that the only way to make Black sea shipping safe, is to force the ship owners operating in the region to sign the ITF collective agreement with those trade unions in their States, which are affiliated with the ITF. The SUR as bluntly said, that there are no parties around capable of making Black sea shipping safer, except seamen and dock workers unions. It’s an alarming, worrisome claim, because the safety of the shipping is strictly professional matter to be attended to exclusively by authorized organizations, not by any self-proclaimed well-doers. And because, alas, the trade unions enjoy too much power nowadays. 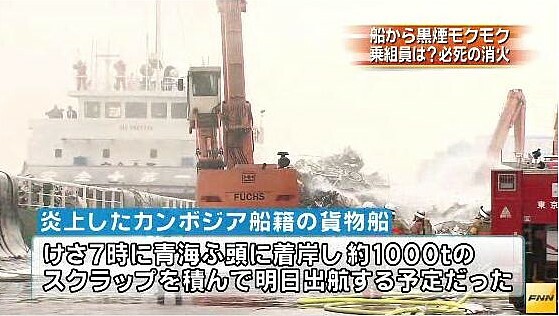 Russian media report the loss of deck cargo, some 40-50 Japanese second-hand trucks, during the stormy voyage across Japan sea, from ro-ro vessel Astongate. 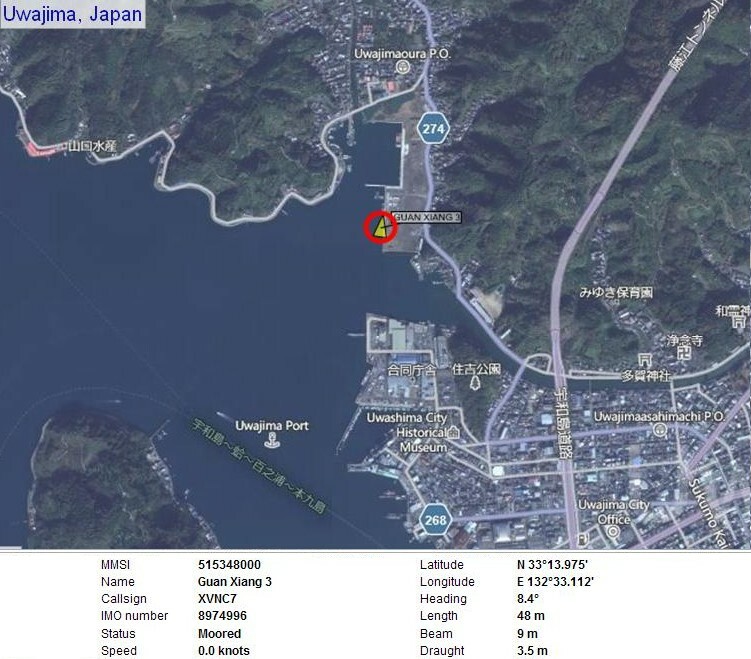 Vessel arrived to Vladivostok port on Feb 4 and later was berthed in Fishery Port, there are no confirmations from official sources about the cargo loss, and where did the rumours come from, is unclear. 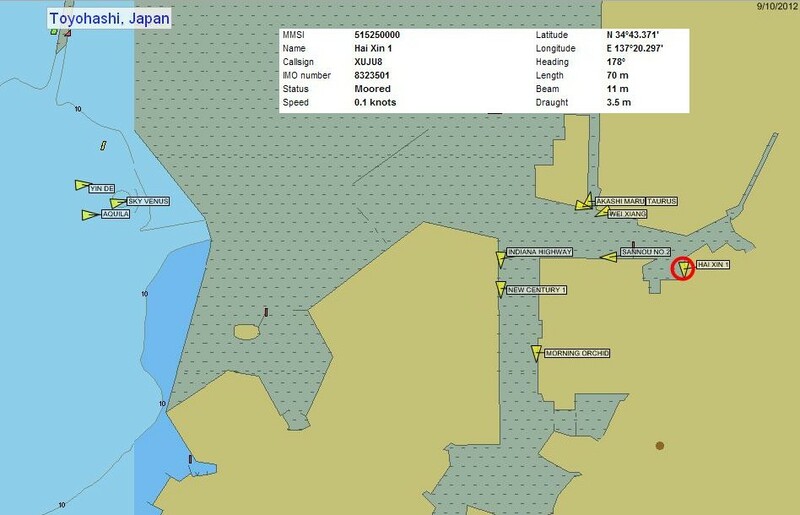 MRCC Vladivostok says there were no distress signals or emergency reports from any vessel during last two days, weather was stormy, but nothing extraordinary in this time of the year. 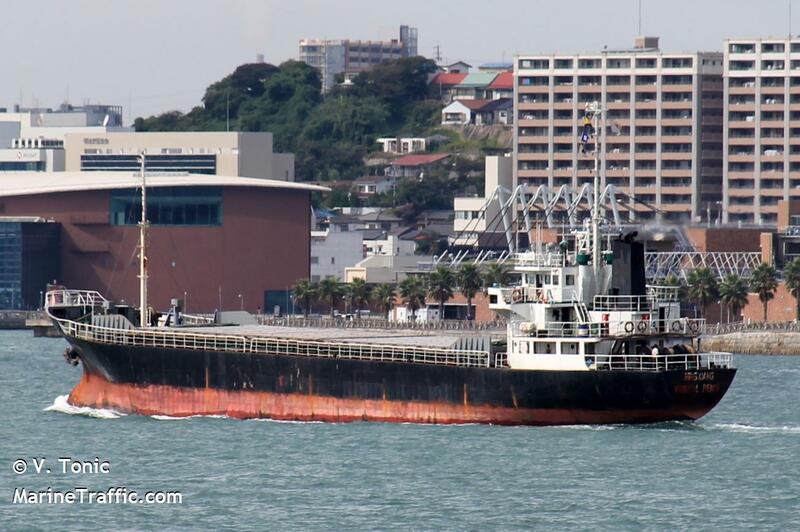 Ro-ro vessel Astongate IMO 8310968, GRT 4998, built 1984, flag Cambodia, manager Natie Shipping Co., Vladivostok. Turkish Coast Guard boats, tug boats and a helicopter were searching for eight crew members after a Cambodia-flagged freighter ship sank in stormy waters off Turkey's Black Sea coast on Tuesday, officials said. 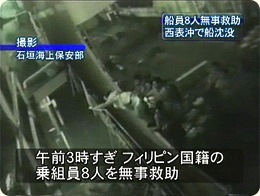 Three other crew members were rescued. 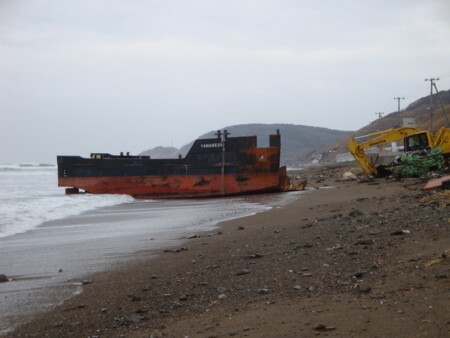 The ship, Vera, was sailing to Turkey's Aliaga port from Russia when it sank off the coast during a storm, regional Gov. Erol Ayyildiz said. 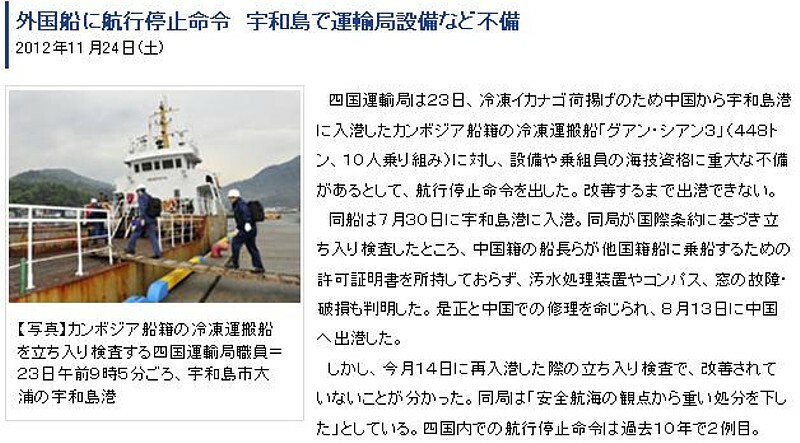 He said police were also searching the shore for the missing crew. Ayyildiz said the ship's second and third captains and its cook, a woman, were rescued and hospitalized. "There is hope that the eight (missing) will be rescued," the state-run Anadolu Agency quoted Ayyildiz as saying. "They are used to the sea, they are experienced. Therefore, until we reach them, we are assuming that they are alive." 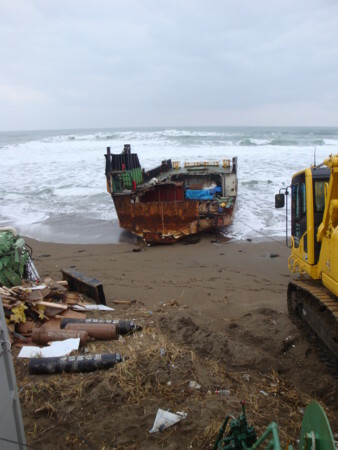 The Maritime Affairs Directorate said there were 10 Ukrainians and one Georgian crew member aboard the ship, which was carrying scrap metal. It said at least three tug boats had joined the Coast Guard search-and-rescue effort, while Ayyildiz said a helicopter had also been dispatched. "By the time the Coast Guard arrived in response to the distress call, the ship had already sunk," Irfan Erdem, head of the Chamber of Commerce for the region, told Turkey's NTV television. 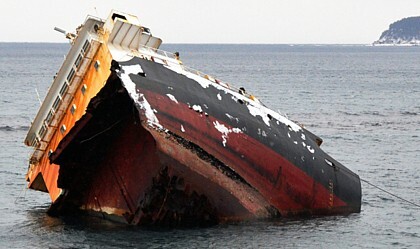 He said a storm likely caused the ship's cargo to shift, tilting the vessel to the side and causing it to take on water. Much of Turkey has been affected by a cold snap that has hit parts of Europe, with stormy weather disrupting maritime traffic. Turkish Coastal Safety Administration published the crew list M/V Vera, Cambodian flag with Turkish owner, 114 metre river vessel. 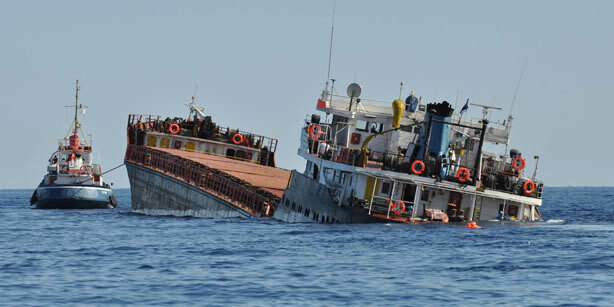 Vessel sank yesterday off Turkish coastal Black Sea town Eregli. Of total 11 crew members, 3 rescued (Including female cook, chief and second officer) the rest being searched in very difficult weather conditions. 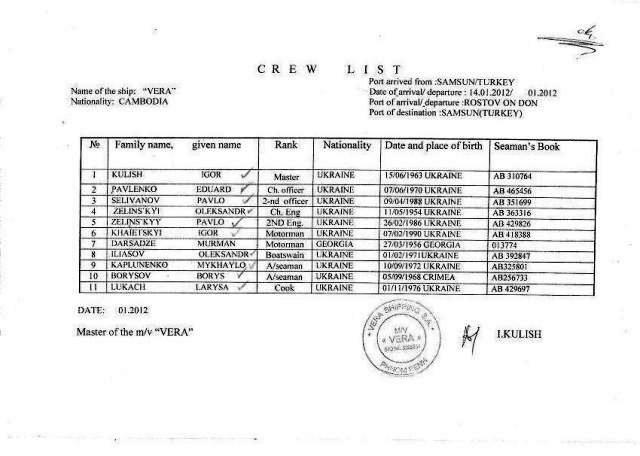 Turkish Coastal Safety Administration published the crew list M/V Vera, Cambodian flag with Turkish owner, 114 metre river vessel. 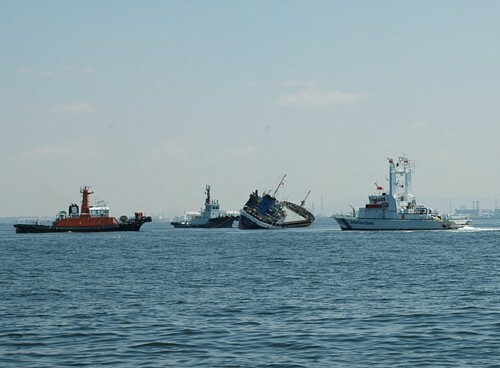 Vessel sank yesterday off Turkish coastal Black Sea town Eregli. Of total 11 crew members, 3 rescued (Including female cook, chief and second officer) the rest being searched in very difficult weather conditions. Turkish Coastal Safety Administration also sent a modern SAR vessel to the accident site from Istanbul,. The modern vessel, KIYEM 1, has advanced search and rescue capabilities and thermal night vision cameras. 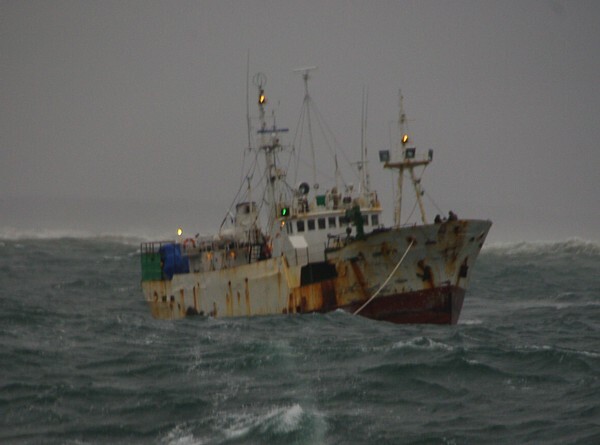 The ship also able to navigate in very adverse weather conditions. KIYEM-1 arrived to accident ste this morning and joined to search and rescue efforts. 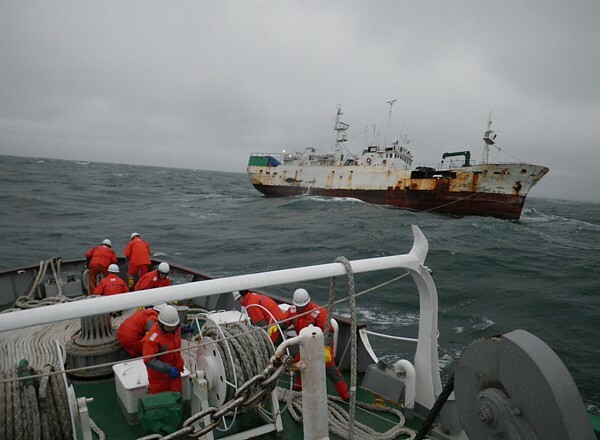 But so far, only 3 out of 11 ill-fated ship's crew members could be taken out of the wild seas.